The Monterey Roadshow will feature a panel session: Laser Phosphor vs. Conventional Projectors, for Stagers: the Myths and the Realities. Are laser phosphor projectors good for the staging side? Pictured here (left to right) at the NYC Roadshow Curtis Lingard from Christie, Barco’s Goran Stojmenovik, and Bret Tracey, Nationwide, who discussed TCO (total cost of ownership) arguments for using solid state video projectors as compared with conventional lamped projectors, and whether the TCO math is more applicable to the installed AV world where a projector is on and being used more hours than a stager would use a projector. The session in Monterey will look at the other features of solid state projectors and when and where they do or do not make sense for the rental & staging user, with both stagers and projector manufacturers sharing their insight, and dispelling some myths about new generation projectors. And on hand for the Monterey Roadshow panel will be industry expert Bill Beck of Barco who will have some intriguing new developments on the laser side of things. The totally revamped Roadshow in NYC in July drew great attendance, and the best part of the good news is that the agenda for the West Coast event coming up will draw on the best of that agenda, and more, and with the keynote for the California event presented by one of the most successful entrepreneurs in the staging world, Gary Becker. Becker is a lifelong entrepreneur and founder of a variety of businesses, though it was the rental and staging industry that was Becker’s first real passion, most notably as founder of Nationwide Wholesale Video, which he sold to Christie. At the Monterey Roadshow, Becker will outline the fundamentals he's paid closest attention to, those that have led to consistent replication of enterprise growth, employee loyalty, and customer delight at the businesses he’s run. "I'm an impact junkie,” said Becker. “I enjoy making things better. So my final venture will be committed to helping others find their way to their best." 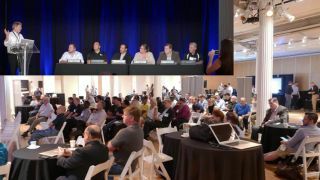 The attendance for the Monterey Roadshow is shaping up to be quite interesting, with owners and executives of medium to large rental and staging companies such as Mass AV, AVTS, AGF Media, McCune AV, TES, DDAV, On Event Services, and more; owners and executives of hotel AV contractors Glastenbury AV, KVL AV, and AVMS; key executives and decision makers from local systems integrators like Streamlife and Media Systems; key managers and decision makers from large university event departments such as Stanford University CSUMB, Santa Clara University, and Cal Poly; key managers from arenas and stadiums, such as Avaya Stadium (MLS San Jose Earthquakes); key managers from Laguna Seca Race Track; corporate and campus, event and facilities managers from companies such as Driscoll’s ($2 billion Berry company), Food Source, Dole, and Robinson Fresh; representatives from hotel/resorts such as Marriott, Inns at Monterey, Pebble Beach Company, etc. ; owners and decision makers from lighting and sound companies Musson Theatrical, Impact Lighting, RGB Lights, Sensory Lighting, Pyramid Audio, and others. Gary Becker was the founder and owner of Nationwide Wholesale Video Equipment Rental, which ultimately he sold to Christie. He will share–from a veteran owner’s perspective–10 keys to successful management of a staging company– whether the goal is managing growth, increasing profitability, or preparing for a transition through sale or acquisition. We’ve all heard the TCO (total cost of ownership) arguments for using solid-state video projectors, as compared with conventional lamped projectors. The “lamp-free” nature of the new generation laser phosphor projectors means that there are no lamp replacement costs over the life of that projector. But that TCO math is more applicable to the installed AV world where a projector is on and being used more hours than a stager would use a projector. Are laser phosphor projectors good for the staging side? To answer that, you have to look at the other features of solid-state projectors and when and where they do or do not make sense for the rental and staging user. In this panel, both stagers and projector manufacturers will share their insight, dispel some myths, and teach you some things about new generation projectors you did not know. A special panel of top stagers and top gear manufacturers reflect on 10 years of industry evolution, and look ahead to the next 10 years. As we’re in the middle of another industry upswing and business is good, it’s even more important to plan now for the speed bumps ahead: buying new gear for your inventory, company growing pains, and more. Special guests include executives of SenovvA, the company that stages the Oscars. Exclusive to this Rental & Staging Roadshow, attendees will have a chance to see some of the latest video and staging gear, hands on, in special demo rooms. One demo will include live event technology for sports facilities, with invited guest from top California facilities. All demo room attendees will be entered for a drawing for special prizes. In this special session, a panel of experts and staging company end users will discuss the challenges of finding and properly implementing the right rental management software package for your staging company. The emphasis will be on the staging company’s perspective, what works and what doesn’t, and how to sort out software, that unlike hardware such as video projectors, does not have “specs” to easily compare. This includes mixer with invited meeting planner industry guests.